Taximi is the improvisation during the performance of traditional musical pieces, using soloistic folk instruments. It has roots in the eastern Mediterranean and Arabic culture and can be commonly found in Greek music and specifically in rebetiko. Taximi is a free rhythm melody, an author’s imagination, alternating between various emotional paths with a passion respective to each one who carries it. The main prerequisite in order to play a taximi is not to have excellent technical knowledge, but rather to deposit your soul. You could say that at this point, rebetiko seems much similar to improvised music. And when that singular sound of rebetiko is embellished by a vast range of sonic influences starting from the blues, traditional music, instrumental exotica and ends in electroacoustic / free improv fields alongside distinctive electronic manipulation, it is certain that we are talking about an experiment moving on the fringes of unexplored improvisation, perhaps pushing them even further. And if you asked us to guess which people are responsible for that, the name of Mike Cooper would certainly be the first to come to mind. 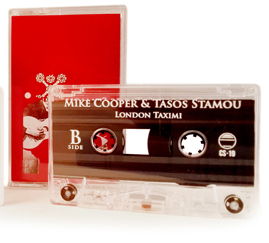 The “London Taximi” cassette consists of some tracks recorded by Greek experimental musician Tasos Stamou and international artistic explorer Mike Cooper. These recordings took place from 2014 to 2016 in London. Although they have been playing together for some time, this is their first joint record attempt. In 66 minutes we hear the two authors “talk” in a very special musical language, whose vocabulary is derived by their common (and not) influences, using lap steel guitar, bouzouki and modified electronic equipment. It’s worth mentioning that even if enough emphasis is given on the sound of rebetiko, the constant flux in soundscapes and the weird use of instruments / effects do not allow for a very specific musical characterization for “London Taximi”. The switch between Stamos’ electronic moments with Cooper’s (always) Hawaiian / bluesy guitar, leaves a momentary space for a rebetiko opening on the bouzouki, but overall “London Taximi” is so many things altogether, that although one could say that the closest reference point to the previous career of Mike Cooper would be the “rembetronika” Avant Roots album with Vivienne Dogan Corringham, it would hardly be an exaggeration to say that “London Taximi” contains music whose like has rarely been recorded. A music that associates every ideological aspect that take form and appeal straight to the heart and the mind of the listener. Tasos Stamou is an electroacoustic music composer and performer, alternative electronic music instrument maker, tutor and sound technologist. He lives in London and leads a series of workshops on circuit bending & hardware hacking for experimental sound production. He has been actively releasing material for over a decade. He performs mainly alone, with the help of his own “portable electroacoustic music studio”, which creates all the sounds he uses on stage, on the spot. He also develops series of visual art, occasionally having exhibition / installation shows and illustrating media. Mike Cooper boasts a music course of sixty years, as he started playing the guitar in 1958. He has since created a universe of releases and performances through the years which is just impossible to describe in a few lines. Even if you are familiar with his work you still don’t know what to expect from a new release, and that non repetitive expressive form is what makes him one of the very few people who have done something really completely on their own in the general folk / country / blues context. And in our musical consciousness, a musical legend. Clear cassette with white imprint. Comes in regular jewel case and 4pp 150g paper covers. Limited to 75 hand-numbered copies.